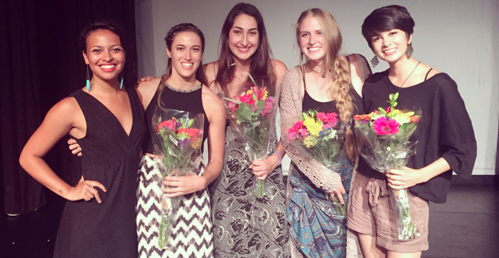 You are here: Home » Breaking the glass ceiling one female choreographer at a time! Breaking the glass ceiling one female choreographer at a time! Scott, this event aims to support young female choreographers as they make their way into the very competitive world of dance choreography. On Friday night, I attended the Electric Lodge to see the four finalists who have been selected for the Breaking Glass Project this year. These four young women have won a year’s worth of artistic and administrative mentorship, and one of the four won the audience’s choice award, taking home a prize of $1,000 and another opportunity to present work at the end of the year. This amazing event is revolutionary for the LA dance world in its foresight and vision for the future of women in dance both near and far. The four artists selected for the program offered diverse views on dance, making the audience’s choice award a very difficult one! The show opened with a piece by Cameo Lethem, entitled A Specious Piece of Reasoning. Wondering briefly if this title was suffering an unfortunate typo, I came home and did what any writer might do when they encounter a word they don’t know—I googled it! And, click, it came into place. Specious describes something that is seemingly plausible but in fact false (my own definition from a smattering of things I read—Thanks Google). The piece began with dancers entering and going to step forward but in fact falling flat on their faces. Again and again, the dancers went to step forward and boom! Down they went. The movement vocabulary was skillfully limited to the needs of the piece, favoring repeated motives rather than endless innovation to make her point. The dancers reached forward and were pulled back, only to be interrupted by falling again and having to pick themselves back up. This first section was set to harry McClintock’s Big Rock Candy Mountain, creating a playful and even comical feel. However, just as the truth of a specious argument emerges upon closer examination, this piece turned into something much more than light-hearted slapstick. The music changed somewhat unexpectedly into a Gregorian chant, and the formerly playful falling became heavy, desperate, and pained. Lethem clearly has a sharp intellect and her ownership of craft, design and discipline to work within a small movement palette shows direction and vision. Following her career, you can expect to be challenged to use your own smarts to keep up. Leanne Iacovette showed her piece 2,900 set to a collection of short music selections ranging from Michael Giacchino to Codes in the Clouds. This piece was distinctly different from Reasoning due to it narrative structure. The dance told a story of a young and man and woman as they weathered the seasons of their relationship. The choreography was firmly rooted in Contemporary*. The gesture driven movement contained the familiar rhythm of impulse and accents combined with flowing torsos and arms. 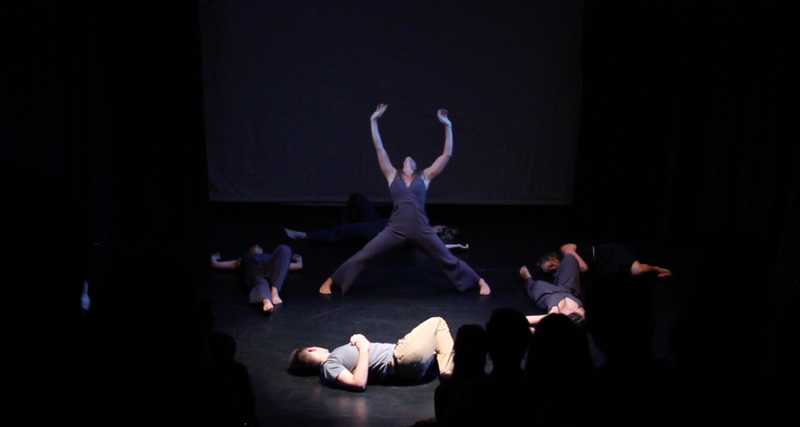 This dance used two choreographic devices that I found quite compelling. The first was the use of four dancers as the barriers between the couple. These dancers, dressed in brown one piece outfits, began as a landscape across the back of the stage, then became the companions of the two lead dancers, and then became the inanimate objects that drove the couple apart. While it might seem confusing as I write it, the intention was quite clear in the moment, and lead the narrative along nicely. 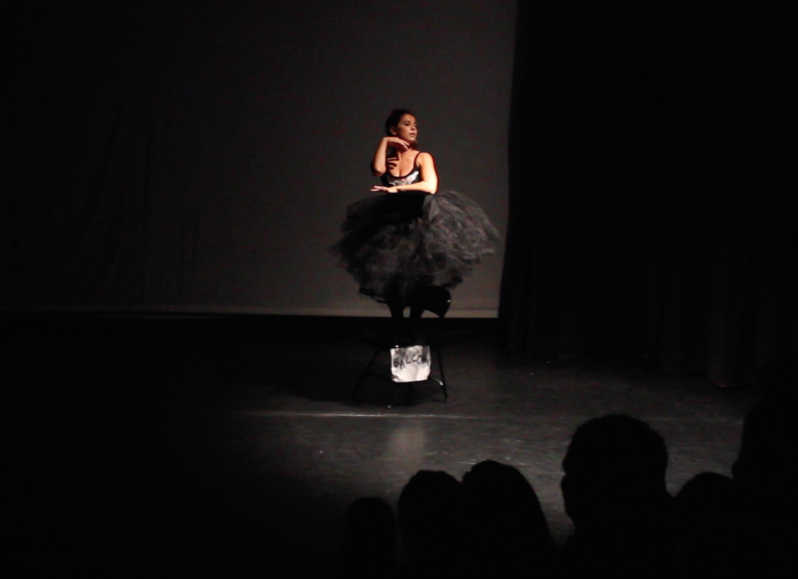 The second device of this choreographer is her use of counterpoint and counter-balance in the space. 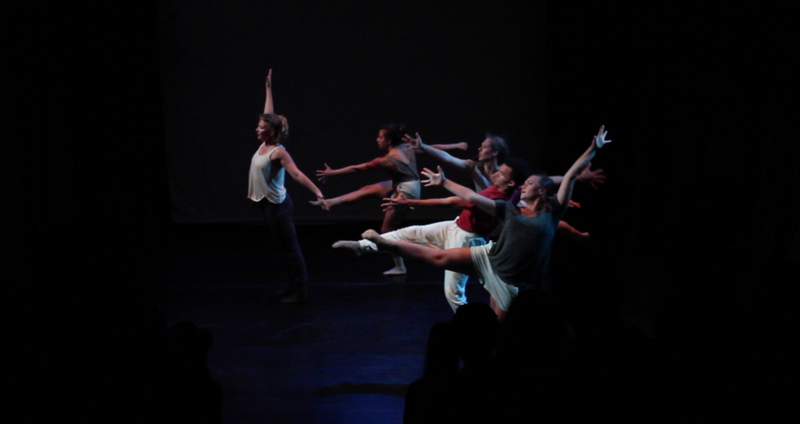 The primary cast of the six often divided into two trios that danced simultaneously with different movement vocabulary and moving through the space in opposition. This created a strong sense of variety in the visual composition of the work and kept it from becoming stagnant. The seventh performer was a young man who slowly crept along the stage in the brief intervals that marked the four different periods of time. This dancer represented time for me and while his part was minimal, it was an unexpected and mature choice by this choreographer. 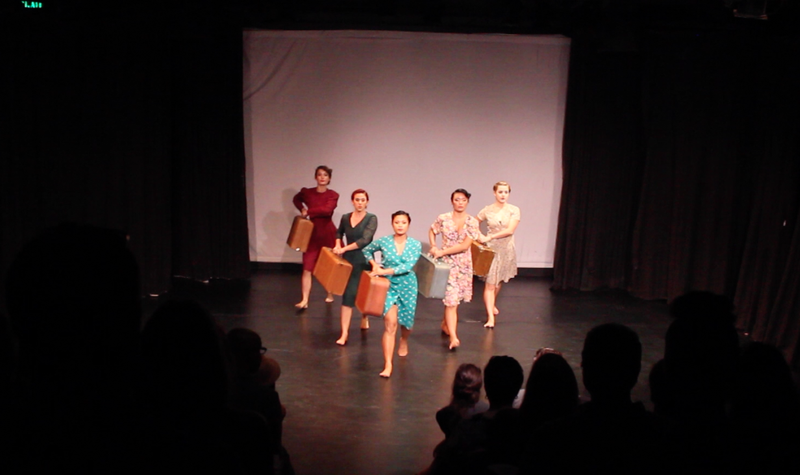 MASTERS OF CHAOS was a female quintet choreographed by Shiring Rehmani. This piece had a provocative opening, with a single woman entering the space alert and buttoned up in her 1940’s vintage dress and leather suitcase. Again, a sense of narrative drove this piece as additional women entered the space, each in a different colored dress and their own suitcase in hand. The movement vocabulary was again strongly rooted Contemporary aesthetics, with a penchant for grouping the dancers symmetrically, creating phrases that are rhythmically driven and directed by the music (by James Vincent McMorrow and Jamestown Revival), and including virtuosic moments of technique within the story telling. The chaos within the piece was not evident at first as the dancers walked through the space in clear control of themselves and their belongings. It wasn’t until the second piece of music began and the suitcase opened that things began to shift. Clothes came flying out into the space and the dancers’ neatly buttoned up world quickly unraveled. However, they managed to put themselves back together and finish with aplomb—well, all except one sleeve that defiantly stuck out of its suitcase. It was likely an accident, but it was a great reminder of the chaos we all hide in our lives that doesn’t always want to stay hidden. The final of the four pieces was Running by Christen Quattlebaum. This piece broke away from the aesthetic expectations set up in the previous works by adding an earthiness in deep plié. The hunched over figures loped into the space half-human half-animal and the hunt was on. These women were beasts in their physicality, hungry for movement and craving the athletic demand of the work, eating it up with ferocity. The theme of running was manipulated in many ways, making it the universal theme without dominating the space with a typical simple running technique. The dancers ran low, kicking their feet up behind them and sprung in the air, launching their whole bodies in a horizon of pumping legs and arms. Next, they paused, listening with their skin in the same way an animal might sense something nearby. This work blended the rootedness of Africanist aesthetics with the Contemporary appeal of rhythmic gestures and quick sequences through the torso and arms. Quattlebaum has a distinct voice that yielded an unexpected world that was visceral. After a brief intermission in which the audience turned in their vote for their favorite of the night, ELSCO company members Karina Roytman and Jeffrey Gugiotti performed a very funny Romeo and Juliet duet entitled Pas de Don’t. A playful respite from the largely serious work of the evening, the audience was able to enjoy a few laughs from this New York based company. Then the winner of the special award was presented to Leanne Iacovetta. The sold out house was a scene of excitement and celebration for all four choreographers who will be growing and learning over the next year. They are the up and coming for the LA dance scene and beyond. Enjoy these artists while they are here before they get carted off around the world! For more information about The Breaking Glass Project visit www.breakingglassproject.org. * In this instance I am using Contemporary with a capital “C” to indicate the style that is currently known as Contemporary as defined on So You Think You Can Dance and further incorporated into studio and commercial dance training programs. I consider this genre to be an extension of Jazz dance and may also refer to it as Contemporary Jazz.